[map] [street view] On Radio Road in Jackson, southwest of the intersection of Business US-412 and North Highland Avenue. [Picture] RDS decoded on an Insignia HD radio from Tishomingo County, Mississippi, with a partial Radio Text and the PI (call sign) fields shown. This station has a very good coverage area, reaching parts of Kentucky as well as northeast Mississippi and on some radios, the fringes of northwest Alabama. As far back as FCC online records go, this station was WKIR prior to 1987, when it became WTNV. During this era it was known as "Eagle 104" and was apparently owned by Clear Channel. In July of 2006 the calls changed to WJGY. 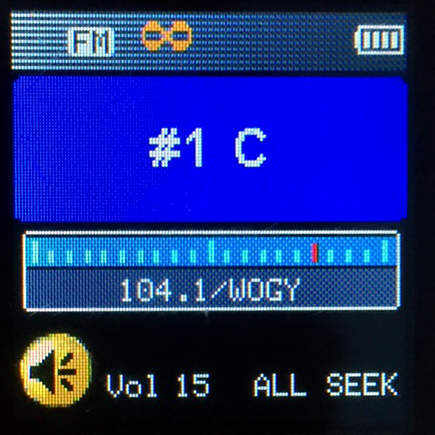 Later that year the country format known as "Froggy 104" debuted and the calls changed to WOGY (frOGgY) in September of that same year.